Be the first to buy these before there all gone!!! Book Early!! These do go fast!! This cannabis tour is for the serious smoking connoisseur!! 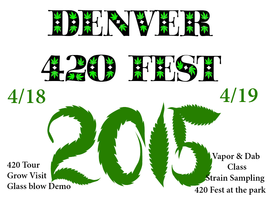 We have a tour on 4/20/2015 and is a great deal. Full day cannabis friendly sight seeing tour going to Garden of the Gods, 3 of the US's only cannabis clubs, free lunch, grow visit, cannabis shopping, open bar with soft drinks and snacks. Go here for more info!!! We can book the entire trip just call and talk to our cannabis vacation pro. Are Cannabis Cup tickets included? No!! This does not include admission to any events, this is for tour only. 21 and over only with a valid ID or Passport. You will not get on with out an ID, no matter the age! We can get you ground transport to an from the pick up point or you can use Uber for quick reliable service. No we will have a guest list. This is a No Refund event.